It has long been my habit to make words speak for pictures. This is because on one hand I am an artist and photographer, and on the other I am a very linguistic person. I come by both things honestly, but sometimes I realize that I am being too lingual when it comes to this blog, and not showing off as many images as a person coming to a photography website in search of their perfect photographer may wish to see. I have realized this before and felt a bit helpless about it, but now with some new knowledge and a fresh way of considering this site, I seek to mend my ways. Starting with the oldest photoshoot that displays my current photographic style, this beautiful maternity shoot, I will be taking the rest of the winter and spring to post storyboards of each family photoshoot I worked on last year and early this year, interspersed with my current sessions in the same style. I hope that this enables anyone coming to this site to look for a photographer of their own to be able to consider carefully and feel like they can choose me with no doubts! Consider, then, this lovely family. 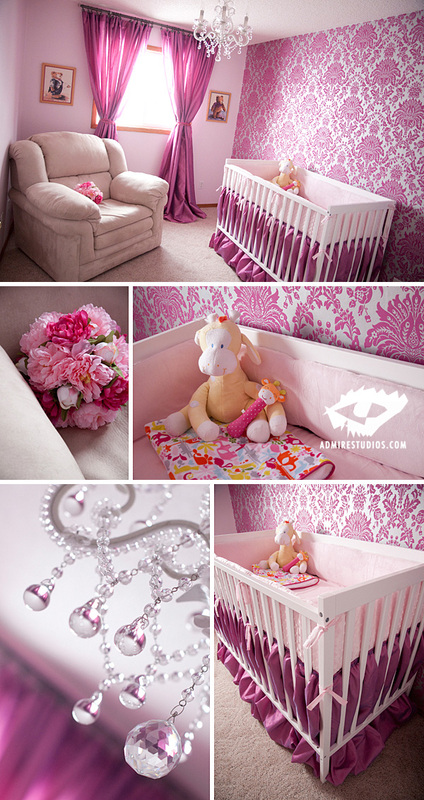 I have yet to see a nursery as tasteful, beautiful, and well-thought-out as Alexandra’s little nest! This photo session was very special to me, as I took these images just after I found out I was going to be an Auntie for the first time. Now my little niece (a Halloween baby) is twice her birth weight and starting to babble, and these images still capture my heart. These photographs never fail to make me smile – not least because of the awesome motherly glow that shines out from all these maternity photos. I hope you enjoy this first piece to the puzzle. You can look forward to a continual stream of beautiful images, right here! If you’d like to share in many more images as they come, please be sure to subscribe to the Admire Studios RSS feed. Thanks! I love this nursery! The images are gorgeous. They should send them in to House and Home! AWW, Twyla, these are gorgeous!! Yes, what a lovely nursery! This little baby is already so loved!! Thanks for sharing! Wow that room is so lovely. Wow, I am so impressed with this site, the images are very inspiring. I am hoping for more inspiring images you have here. Keep it up!